The Silk Road was a vital route not just for physical goods but ideas as well, and it had a significant impact on the spread of Buddhism through Central Asia. The cradle of Buddhism is to be found in Iron Age India. Around the middle of the 1st millennium BC, this region went through a sociol-cultural change known as the second urbanisation; an era marked by intellectual ferment, the composition of the Upanishads and the emergence of Sramanic traditions. Out of this, Buddhism formed between the 6th and 4th centuries BC. The spread of Buddhism was slow until the time of the time of Emperor Ashoka the Great, who rules most of the Indian subcontinent from circa 268 to 232 BC. He supported the spread of Buddhism, as did his descendants, and mighty efforts were put into the construction of religious memorials and the spread of Buddhism throughout Central Asia and south into Sri Lanka. The Central Asia effort is what eventually brought Buddhism to China, while the Sri Lankan mission helped spread the religion to the coastal lands of Southeast Asia. Ashoka sent out emissaries to many of the lands west of India, reaching Hellenistic countries in Central and West Asia, and even the Meditteranean and some evidence indicate that these emissaries were accompanied by Buddhist missionaries. 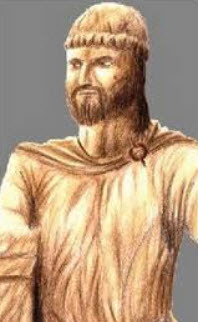 The important Kushan ruler Kanishak, who reigned from 144 to 172 AD, converted to Buddhism and helped the religion spread in the Kushan kingdom. The Kushans controlled an area stretching from today’s Hindu Kush to Kabul, Gandhara, northern Pakistan and north-west India. This was a very strategically important land, since Silk Road caravans passed through, and also connected here with trade routes coming up from the Indian subcontinent. After Kanishak’s conversion to Buddhism, the Buddhist settlement Gandhara flourished, and it was here that a very distinct Graeco-Buddhist art form developed; so characteristic of a population centre located at a crossroad where Greek influences co-mingled with Indian ones. This art style would eventually come to have a major impact on art in many parts of Central and Eastern Asia. As Kushan influence increased, so did the spread of Buddhism. Before the 2nd century was over, the religion was so well-established among the Parthians that Chinese records contain information about Parthian Buddhist missionaries. Buddhism was established in Bactria during the 1st century AD. Archaeological evidence shows that there a Buddhist settlement from this period at today’s Airtam, circa 18 km northwest of the city Termez in southernmost Uzbekistan. Over the next few centuries, Buddhism continued to spread, with Kushan/Bactrian religious centers being established in places such as Hadda, Kondukistan and Bamiyan. The monastic communities that developed in Bamiyan (in today’s central Afghanistan) grew to be especially important for the development and spread of Buddhism in Central Asia. During the 5th century, three colossal Buddhist statues were carved on the cliff face of a mountain near Bamiyan. One of them was a 53 meter (175 feet) tall standing statue of Buddha – the world’s tallest Buddha. For much of the 2nd millennium AD, Bamiyan was a crucial hub of trade and had a cultural exchange with cultures such as the Greek, Turkish, Persian, Indian and Chinese. 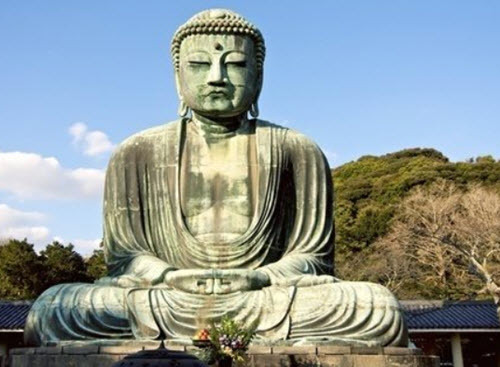 As the area eventually became Muslim, the three massive Buddhist statues were left unharmed for approximately 1200 years under various Muslim rulers. In March 2001, the Taliban destroyed the three statues, claiming they were an affront to Islam. 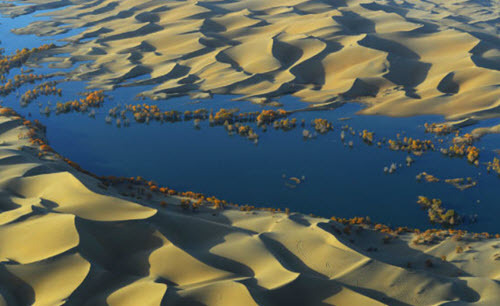 The over 1 million square kilometres large Tarim Basin is located in northwest China, bounded to the north by the Tian Shan mountain range and to the south by the Kunlun Mountains. Generally speaking, the basin is arid, with the Taklamakan Desert dominating much of the territory. Chinese sources report that the basin was inhabited by nomadic pastoralists in the 1st millennium BC. After losing battles with the Xiongnu in the 2nd century BC, these pastoralists split into two main groups: Dà Yuèzhī and Xiǎo Yuèzhī. They helped establish the Brahmi script in the region, which in turn played a central role in the Silk Road transmission of Buddhism to Eastern Asia. As the Chinese influence increased in the 6th century, Buddhist art in the area started mixing Chinese elements with the prevailing Indo-Persian style. By the 7th century, all the small kingdoms i the Tarim Basin were Buddhist and used Sanskrit for religious purposes. By the mid-600s, Kucha had emerged as a leading centre of the version of Buddhism known as Hinayana Buddhism. Kucha was a kingdom located on the branch of the Silk Road hat ran along the northern edge of the Taklamakan Desert in Tarim Basin, south of the Muzat River. Examples of other important Buddhist centres in the region were found in Yarkand, Khotan, Tumsuk, Aksu, Kizil, Dunhuang, Karasahr, Loulan, Cherchen, and Miran. In centres such as these, Buddhist texts were translated from Sanskrit to local Indo-European languages and dialects, making it easier for missionaries to spread the religion. Just like Kucha, the northern-route Kashgar, Kizil, and Karashahr were dominated by Hinayana Buddhism. Along the southern route of the Silk Road, Mahayana Buddhism was more common, with Khotan and Yarkand being two notable examples. According to Chinese sources, Buddhism had reached the Xiongnu as early as the 2nd century BC, and certain statues indicate that they had converted to an early-stage Buddhism. What we can see is that when nomadic tribes on the steppe converted to Buddhism, it was often followed by them becoming less fierce soliders and the tribe eventually being absorbed into the culture of its non-nomadic neighboors. One example is the Toba, also known as the Tobgatch Turks, whose empire once extended to Mongolia and northern China. From 386 to 534 they controlled northern China under the Northern Wei dynasty. The Tobas came in contact with Buddhism fairly early on, and some of their emperors promoted the religion. A pivotal change occured during the 5th century. The Toba King Hung was a deeply religous man who was so devoted to Buddhism that he sent his son the crown prince to be a monk. This son took the throne in 471 and kept it until 499, and as King Hung II he introduced a more linient and compassionate legislation in the Kona territory. He also brought the Tobas much closer to Chinese culture than they had been before, and by the late 5th century the Tobas were considered a completely sinicized people. King Hung II even moved the Toba capital from Pingcheng (Datong) on the cusp of inner Mongolia to Jehol (Chengde) which is much further to the east. Interestingly, the Eastern Turks disassociated themselves from Chinese Buddhism in the 680s, during the Kingdom of Kok-Turks, and returned to their ancestor’s nomadic life style and religion. A 10th century envoy from China reports that Koachang, located near Turfan, was a flourishing Buddhist center with roughly 50 Buddhist convents and an extensive library holding Chinese Buddhist texts. Turfan remained the focal point of Turkish Buddhism until the late 1600s when its ruler converted to Islam. In the early 1900s, amazing collections of surviving Turkish Buddhist literature were found in Turfan, Hami and Dunhuang. The Western Turks, which were a force to reckon with on the steppes from the mid-700s and onward, established Buddhist sanctuaries in the Kapisa area, near present-day Bagram in Afghanistan. We also have a report from a Chinese Buddhist monk named Wu-kung who visited Gandhara between 759 and 764 and he reported that there were Buddhist temples there and that he believed that they had been built by Turkish kings. The famous Kublai Khan, who ruled the Mongol Empire from 1260 to 1294, had a strong preference for Buddhism and promoted it in various ways. He had a great influence over the Silk Road and could help aid the safety of Buddhist missionaries travelling along it through Mongol controlled regions. The texts of European merchant and explorer Marco Polo who visited Kublai Khan in the 1200s describe how the great khan arranged a highly extravagant ceremonial reception for relics of the Buddha that had been gifted to the khan by the Raja of Ceylon (Sri Lanka). 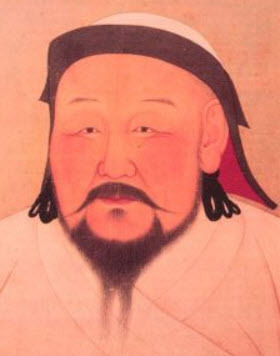 Even though many Mongol peoples eventually converted to Islam, Kublai Khan’s direct successors continued as fervent promoters of the Buddhist religion. Khaishan Khan (1307-1311) did, for instance, ensure the translation of a wide range of Buddhist texts into Mongolian. We do not know precisely when Buddhism first reached China, but we do know that Buddhist missionaries and pilgrims travelled along the Silk Road between India, Central Asia and China during the second century BC.